Almost all the great religious thinkers of the past have developed a social as well as theological doctrine, but their sociology was as a rule merely implicit in their work or at best half formulated so that careful study and analysis is needed to bring it out. This is the task which Dr. Stark has set himself in the present essays. He has searched the writings of St. Augustine, Paschal, Newman and Kierkegaard for the sociological ideas they contain and shows that their social philosophies were varied, profound, fascinating and surprisingly definite. 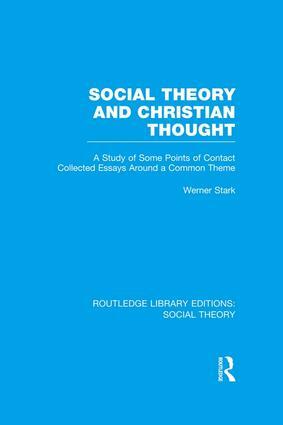 Dr. Stark seeks the theological conceptions present in, and basic to, the teachings of some outstanding secular sociologists, economists and philosophers, such as Adam Smith, Kant, Hegel, Marx, the Darwinians, Bergson Scheler and Meinecke and proves that their systems were built around a religious centre even though they themselves were at times unaware of it.